Private Bass Guitar tutoring lessons Dundee, MI. Check out some of our most popular teachers near Dundee, MI including Perrysburg, Toledo, Holland, Milan and Napoleon. The groove is what it's all about. Learn to play as part of the backbone of the band. I will get you going on the basics of technique, theory and genre specific grooves. I provide drums and other tracks so you can get real world playing experience under your belt. It's fun to get into pocket and jam! TakeLessons.com Instructor since 2012, Kyle K. is now available for online lessons worldwide featuring a screen sharing experience like no other for personal and detailed instruction! Kyle has been playing guitar for over 25 years, written hundreds of songs and is currently a professional composer and sound designer for television and Hollywood movie trailers. Credits include all major networks and shows like American Idol, NFL games and movies like Jurassic Park and Independence Day. He has developed his own method of teaching to positively build on the student's strengths, dexterity, ear-training, natural technique, memorization and creativity. d is used to maximize results! "I love music! To me, it's a way of life. From listening to playing to writing and of course teaching. I grew up with music all around me at school and home. My dad was a piano player and teacher so music has been a part of my life since day one and I want to share what I have learned. Everyone has a unique musical talent and I enjoy helping them find it. I believe that anyone can be an excellent musician. Playing an instrument should be a fun and creative adventure. Whether it's strumming at home, playing out in the clubs, or writing the next big hit, I will do my best to get you there! My musical life began when I was in 5th grade and my dad bought me a saxophone, which I played for over 12 years. I quickly learned how fast I could improve if I simply kept playing with focus. When I hit my teen years I fell in love with rock music and mowed enough lawns to buy my first guitar. I jammed and wrote songs with many other musicians and several bands over the years. We played countless shows and released a few albums. Now I write and produce music and sound design daily for TV, Film and Trailers for companies like Disney, Universal, MTV, NFL and many more. I started teaching 11 years ago and found that it is one of my favorite things to do. Helping others grow into great musicians is rewarding and fun. I've learned that from grade school to retirement, each student is a unique and special individual. My lessons reflect that fact so that we can reach all your goals together. *My personal goal is to get my students to understand and write music that will stay with them and encourage them to continue." All lessons take place in a fully operational Digital Recording Studio and dedicated lesson room. Gaining real world playing experience with current technology is a definite advantage over traditional lessons. This also allows the student to capture ideas when songwriting and provides a unique playing experience. Imagine looking back years down the line, listening to something you wrote and hearing the improvements and your own personal music history. That's what writing and recording as you learn is all about. Everyone is different, and every lesson should be suited to fit the individual. Depending on the type of lessons (guitar, bass, music production, theory, etc.) the style teaching will be adjusted to fit. It's all about YOUR goals and needs. Each student is going to receive lessons based on their preferences of genre and style of music they desire to play. I expect my students to practice regularly and have a good time as their abilities and knowledge grow. By working together, we can focus on goals and problem solving to get you to the next level of play. Most importantly, we are going to have a blast while we learn to play music! *We'll start slow and build your knowledge base with each lesson. *You can expect to understand what you are playing AND be able to write your own music is desired. *You will be given everything you'll need to succeed including custom made drums and songs to play with so you can improve at home. Let's start learning and improving today! I currently do not travel. My studio is the #1 advantage for learning! *Instruments: Guitar & Bass -Rock, Blues, Metal, Indy, Folk and Americana styles. *Production: Ableton Live, Recording, Mixing, Mastering, Programming, Virtual Inst, MIDI, Production, Sound Design. *General Music: Theory, Songwriting, Producing. Kyle K has a unique teaching style. His Ableton Live knowledge has no bounds. In just five lessons he talked me through most of my usual brain-fog to help me understand, in the simplest terms, how to use Live to record music and use Midi to enhance your work. Super, Super man, Kyle is. I highly recommend Kyle if you need a teacher. John G.
Kyle employs an interactive teaching style that a total beginner like me needs to begin to understand how Ableton works. Kyle is a patient instructor. That's what I need. Learn components of the bass, fretboard, strings, notes of music, major and minor keys, chord construction, scales, shapes, transcription, reading, ear training, timing and rhythm, music theory, improvising, several playing techniques, how to play songs, and much more. i teach not just to play but to understand what you are playing. i teach all genres, and i teach you to understand the music on your instrument. I aim to instill a sense of groove, to teach the students how to play well with other musicians in a band setting, as well as advancing their own personal development on the instrument through various technical and rhythmic exercises. Most importantly how to love holding down the low end. My teaching style is relaxed but with a firm accent on Practice. We can cover the basic genres of Blues, Pop, Rock, and beginning Jazz. I know some "slap" and "snap" techniques for Funk. I am fluent with either the use of a guitar pick or fingers. I have an Electric Bass, but I could also teach Acoustic Stand Up. My doctorate is in music and I have experience teaching music at multiple universities, as a public schools teacher, and as a private instructor. I have played bass guitar in several different types of musical groups ranging from rock bands to jazz combos.For beginners, I recommend Essential Elements for Band, Book 1 for Bass Guitar. For booking, please sign up with TakeLessons today, and then we'll arrange a mutually agreeable meeting time. I look forward to hearing from you! Wether you are shooting for the Hollywood Bowl or just want to jam out with your buddies, I am here to help you reach your goals! We will cover everything from bass lines and licks to basic theory and your favorite tunes. Having grown up with two teaching parents and a teaching sister, I think it was pretty clear what I was going to be when I grew up. After touring all over the world, having songs on TV and radio and being signed both as an artist and a songwriter, I have learned some amazing things and I love passing that knowledge on through teaching. Being able to share the joy music has continued to bring me is an awesome feeling. You can contact me with questions above ^^ or book your first lesson to the right —> to get started today! Choose from one of my exciting lesson plans! 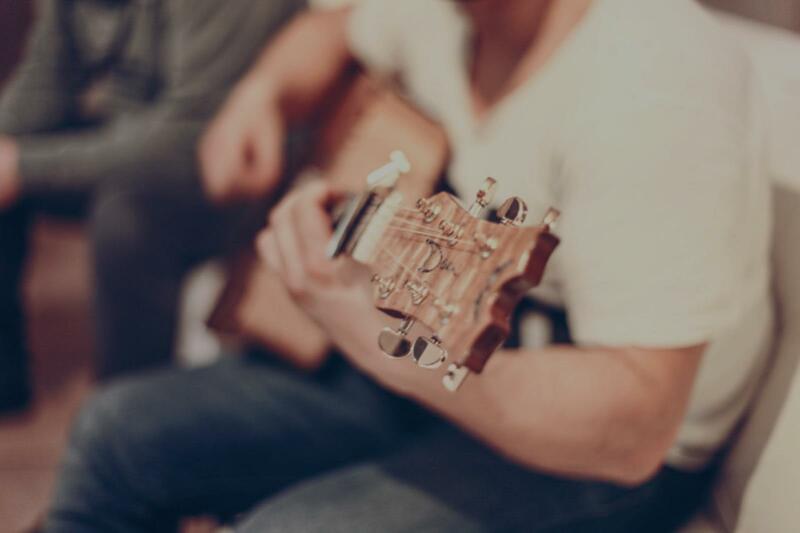 - Guitar 101: (acoustic or electric) We will work on your favorite songs, chords, melody, ear training, technique, scales, theory and more. I will also provide instruction on playing guitar and singing simultaneously. - Singing 101: We will cover the basics you need to sing with proper technique. We will also tackle breath support, upper, middle and lower register, vocal stamina, scales and we will learn your favorite songs. I will provide instruction on singing harmonies, tackling extreme vocals, and how to play guitar and sing simultaneously. We will also cover artist development for students who are interested. Signed to BMG Production music, writer for Vanderpump Rules on Bravo and my single “Better With You” received airplay on national radio in Sweden. I am currently working on my sophomore ep to be released later this year through The Den//BMG. East and Japan and more. I currently play bass and sing for Bay Ledges. Moa is a great teacher. She really understands how to bring out the best in people. I've been talking lessons with Moa for the past month and I've already learned a lot and can tell my voice is getting stronger. She's a great instructor. Great first lesson! Moa is very cool and patient! Can't wait for the next one. Experienced teacher of over 20 years. All styles, techniques taught..focusing on fundamental musicianship for beginner/intermediate levels. Hal Leonard books used with lessons tailored to students goals and musical tastes. Teacher and staff member of Victor Wooten's Bass Nature Camp and Gerald Veasley's Bass Bootcamp for over 15 yrs. Let's have fun and learn together!! Electric bass Lessons on 4/5 string. Scales, bass lines, timekeeping, music theory. Music style Rock, Blues, Funk etc. Jazz, smooth jazz, Latin etc. I'm located in the Tampa Bay area FL. Also, I provide online lessons nationwide. Can't find a teacher in Dundee, MI?